ice cream at noon: Toot-toot-tooting my own horn. I'm extremely HAPPY to announce that my humble studio AG was awarded in the 365: AIGA Annual Design Exhibition 30. There were over 3800 entries, and 182 examples of design *excellence* were chosen. 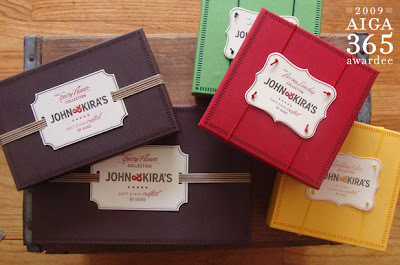 This charming John & Kira's box system was created to reflect the extreme amount of tender care and absolute deliciousness that go into each and every handcrafted J&K chocolate. The letter pressed labels are printed with Mad Maude Press, and the boxes are being manufactured with Simkins Box Corp. in Philadelphia. ...and toot you should! Very classy. Can't wait to see more. hi lady! way to go...i love that you're staring your own biz.